Whenever you see a musical or live performance, you always have to keep in mind that the quality of the show depends on both the script and the cast performing it. I know this. 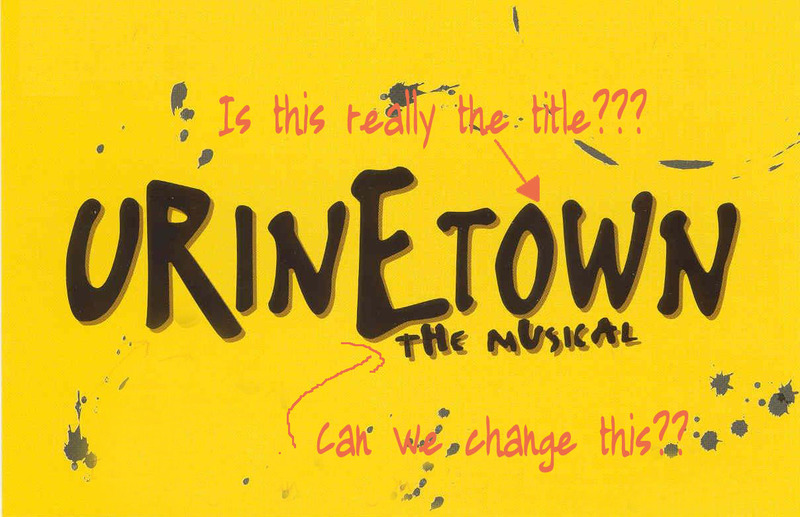 I also know that Urinetown failed in both respects when we saw it performed at the University of Pennsylvania last week. Maybe it's good on Broadway. The script would likely be identical, but the actors might be better. Maybe. I'd be willing to see it there just to be sure. But I definitely do not want to see it again anywhere else. Let's start with the script. It was hard to follow, so they apparently thought a narrator was necessary. Fair enough, lots of plays and musicals have narrators. The Urinetown narrator, however, was not just a narrator, but also a character in the play. He'd step out of the performance every so often to narrate. Fine, that's actually kind of original. But his narrating was very detached. He'd say things like, "well, this is a musical, so the hero has to win," and things like that. Yes, that's original, but it wasn't original enough. I found myself thinking, "Oh, come on," more than once during his narrating. He was also extremely over acting, but I'll come back to that. As for the rest of the script, it felt like it was trying to be funny while maintaining a serious overtone. The whole thing was very hard to believe, which, granted, isn't a bad thing for a musical. But even stories like Wicked, which are so firmly in the realm of fantasy still have a spark of believability in them. There's a chance this could actually happen, and that's what keeps the audience so enthralled. This didn't exist for Urinetown. Not even close. What's more, there were so many sexual jokes and awkward moments, that it was distracting. You almost found yourself not paying attention to the dialog, just waiting for the next cringe moment. Everything from slaps on the behind to a female character shoving a male character's face into her definitely too exposed chest. Necessary? No. Humorous? Definitely not. To top things off, at the end of the play, it's revealed that the whole thing had a political agenda! They finish it off reminding the audience to be conservative with their resources. I almost gaged. If it hadn't been the end of the performance Ii probably would have gotten up and left. Now on to the actors. Most of them were really good. Some were terrible. Unfortunately, the terrible ones had the biggest parts. The narrator, as I said, overacted to an extreme. The male lead was actually very good, but his performance was marred by the sexual jokes. The female lead was also quite a good actress, but her revealing outfit definitely took away from her performance. And most of the other characters overacted. But hey, this is college theater. This wasn't the Academy of Music or Broadway. So bad performances are to be expected. I just find myself wondering if it could really be that much better on the professional stage.